As sometimes happens on opening day, the shooters were rusty. Our gun dogs, fresh off a summer of training, were not. So after a couple cripples sanctimoniously sailed behind us into thick cover, I took my dogs to find them. Normally, this task results in mixed emotions. It's satisfying to watch a trained dog successfully track down and retrieve a wounded bird. But it can be painful, too, especially if a retriever fails to reappear quickly. Take the worry out of any hunt by having your dog wear a GPS collar. When your dog is gone for 30 minutes in thick cover on the trail of a barely-dead duck, all sorts of nightmarish premonitions run through your head. With Blitz heeling on my left and Remy to my right, we walked to the end of a point. I knew the ducks were on the far shore, somewhere, so I sent both dogs simultaneously and waited. They reached the cattails and disappeared. Instead of being anxious, I was calm and collected. Not because I had full confidence in the dogs (I did, kinda), but because I was armed with one of the coolest dog gadgets in modern duck hunting: A GPS e-collar. GPS collars, like the SportDOG Brand TEK 2.0 and Garmin Alpha 100, certainly aren't new inventions, but their use in the duck marsh is. I'm here to tell you that there are more reasons to own a GPS training collar than you realize. Looking at the LCD screen, I flipped to the map page and zoomed in. There were two indicators. The one that blinked "Blitz" was zig-zagging south and had covered 100 yards at a hot pace. The other signaled "Remy," and was meandering north. Five minutes later, Blitz returned with a young redhead that had taken him on a whirlwind tour. Remy bid his time, eventually finding the eclipse mallard and plopping it in my hand. I didn't sweat a drop, because I'd known where both dogs were the entire time. Currently there are two companies that lead the GPS collar charge, SportDOG Brand and Garmin, with feature-packed units that offer the most technological punch for the price. Both the SportDOG Brand TEK 2.0 and Garmin Alpha 100 are tracking and training collars in one. This is essential, because you are always aware of exactly where Fido roams, and can issue corrections if needed. As a waterfowler, you might not realize just how important the ability to track is. But ask yourself, just how sure are you that your dog won't ever get lost, or stuck, or not come when it's called? "I'd rather be safe than sorry," said Michael Witt, a Wisconsinite and professional dog guru with more than three decades of experience handling retrievers and flushing dogs. "Even if your retriever never goes more than 100 yards, a GPS trainer mitigates uncertainty." The Alpha 100 and TEK 2.0 have ranges of nine to 10 miles, which is likely way, way more than you'll ever need. But I like to think of it as robust peace of mind. If a dog on a blind retrieve takes a bit longer than anticipated, check the map. If you're sitting around the parking lot and suddenly your dog disappears, look at the map. From hunting amongst towering Phragmites on the Great Salt Lake to carpets of wild rice in Minnesota, a GPS allows instant feedback whether your retriever is 5 feet away or 500. It's good to have the option to stimulate with a GPS trainer, however they take some getting used to. Utilizing one as a training tool during the off months will certainly work (and having the GPS tracking function if you're running a search drill in cover is great for keeping tabs on a young dog) but it can be somewhat cumbersome compared to a traditional remote. Not only are GPS collar systems great tracking devices; but also serve as excellent training tools. The Alpha 100 is a touchscreen, which is functional though it has some heft and size to it. If you're someone who constantly shifts stimulation strengths during training, the TEK 2.0's control wheel conveniently scrolls through levels so you can administer corrections quickly. After all, the faster a correction, the more successful the result. Likewise, these GPS training collars are excellent recall mechanisms. Along with multiple stimulation levels, they are equipped with vibrate and tone functions. If your dog is already trained to recall with a whistle, transferring that skill over to tone or vibrate is a breeze. When he's gone to the races or off on that cripple a bit too long, giving a beep or buzz will get him going in the right direction: back to you. Aside from the dog handling aspect, the SportDOG Brand and Garmin handhelds are, at their core, traditional GPS units. "Having a GPS gives you the confidence to try new spots," Witt assured. "If you're hunting a new state, or just trying a new public land spot near home, doing some scouting and marking those locations the night before makes it easy to find them again." Having a GPS also allows you to log all those prime hunting spots you've come across throughout the season. And because you're going to have it along anyway, all the waypoints you've put in — that hidden beaver dam, the old duck blind, or the perfect puddle duck spot — will be there. Tracking the route to your refuge lottery blind the day before will assure you are sitting in the right one come sunrise. Pre-loaded topographical maps in both the Alpha 100 and TEK 2.0 add welcomed detail, too. If more than one of you has the same GPS tracking unit, you can keep tabs on each other. Just like syncing a collar to the remote, it's simple to add another GPS unit to your own. This is a great safety feature, especially if one of you decides to take a walk and jump some ducks. I'm as die-hard a duck hunter as anybody, but also keenly aware that variety is the spice of life. Plus, with a pair of dogs, I'll take whatever opportunity I can to pursue fowl with them. A GPS-enabled collar is the ATV of trainers. For versatile dog owners, there are point features that show when a dog is holding steady on game. And anyone who has chased ruffed grouse in poplar stands knows how quickly a dog disappears. Don't forget about deer hunting, too. Shoot that Booner at last light and need to wait until morning to track? Mark a waypoint at the last sign of blood, then come back in the morning. Bring your dog along to help in the recovery (where legal, of course). 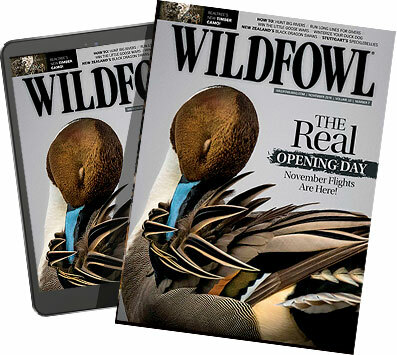 To see the rest of the reasons your dog needs a GPS collar, check out the April/May issue of WILDFOWL.